Little did I know when I had dinner with Adm. Jim Stavridis last Sunday that two days later news would surface that he is on the short list for the Vice Presidential pick. He did confess that the next president will face challenges whoever "SHE" may be. I am not a fan of Generals and Admirals. Ever since the Vietnam War, our military leaders have been so wrong, for so long. Perhaps this is too harsh, and ultimate blame should go to the politicians. But our military leaders, for the most part, just went along with insane schemes. Some six to seven million civilians have died in Korea, Vietnam, Iraq, and other broken countries, not counting dead American soldiers. Most of the dead came as a direct consequence of misguided, blunderous, counter-productive military fiascos. As a result, there are failed states all over the Mideast and Central Asia: Afghanistan, Iraq, Libya, Sudan, and Syria, mostly as a consequence of US military campaigns. Millions of refugees are swarming over Europe displaced from their homes. The EU is in danger of falling apart as a result of this massive immigration from these dysfunctional states. But when I heard Admiral Stavridis talk I knew instantly that this guy was the real thing -- a genuine soldier-scholar, a thinker and a writer. He has a Ph.D, has written three books, most recently The Accidental Admiral, and dozens of articles. He seems to know the world so well and think so strategically, he is not war-drum beater. 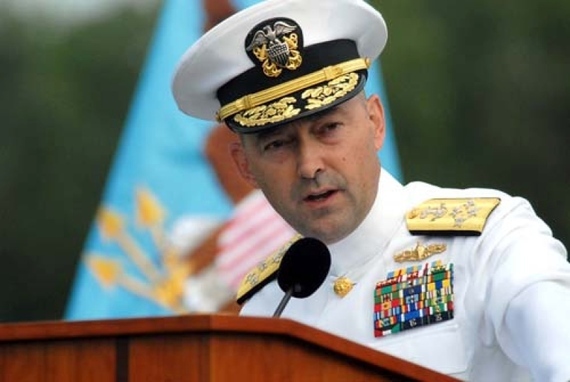 As a retired admiral, Stavridis has served as Supreme Commander of NATO (2009-2013), and currently is the Dean of Fletcher School of Law at Tufts University. He agrees that grand-scale military intervention in the Middle East has resulted in much of the region's destabilization. With millions of refugees the failed intervention is clear. Anti-American fury, which is rampant throughout the Middle East as a result of military actions, is a continuing threat to our soldiers and civilians. These are truths the Admiral is willing to accept. He listens. He knows the world well and though empathetic and compassionate, he also possesses a succinct and strategic mind to safeguard US lives and interests. What is intriguing about this possible democratic nominee is that Donald Trump is determined to make this election about who can protect us the most in this dangerous world. Like a true demagogue, Trump is already gearing up to scare the bejesus out of the populace. Weekly terrorism attacks, domestic and overseas keep bolstering his candidacy. With 1968 Nixonian overtones, his campaign theme is focusing on "I am the only one who can keep America safe." This is the wheelhouse swing he intends to ride to the presidency. To beef up his credential on terrorism, Trump is vetting Retired Lieutenant General Michael Flynn to be his running mate. Clinton -- although often known for her hawkish views-- is already having a tough time besting Trump on the issues of national security and terrorism in the polls. By a margin of 15% Voters have more confidence in Trump to deal with terrorism. But by choosing to run with 4 Star Admiral, Stavridis would be the perfect Clinton foil to Trump's lower ranking Lieutenant General Flynn. Stavridis and Clinton worked closely together when she was Secretary of state and Stavridis was Supreme Allied Commander of NATO. When Stavridis is in full dress uniform, he can barely wear the more than 50 metals he earned during his illustrious service. Such a choice would make Clinton bulletproof on the issue of national defense and the ability to protect us from terrorism. Consider Trump's rhetoric: he yells for carpet bombing the Middle East and reiterates walls, walls, walls. In comparison, Stavridis tells me, "Walls don't work." He says, "Instead of building walls, we need to build bridges." "In order to combat 21st-century threats like cybercrime, terrorism, trafficking and piracy, the military cannot work alone," he says. He brings up Wikipedia to further prove his point. "[Wikipedia] was not created by 12 brilliant people locked in a room. Wikipedia is tens of thousands of people inputting information daily," he says. "It's the perfect image for the fundamental point that no one of us is as smart as all of us thinking together." This represents a kind of Wisdom of the Crowd approach with democratic overtones. Cyber terrorism, not ISIS, is our biggest threat according the Admiral. A separate force with large resources should be created to focus on this. Stavridis also stressed that we must begin working with the Russians. He says, "NATO and Russia will need to cooperate in order to achieve a political and diplomatic solution in Syria." As a supporter of smart power and diplomacy, this was a guy I could listen to. A guy I could get behind. Cynics, however, will likely dismiss the pick as a move back to the right: an attempt to appeal to the swing vote, middle of the road conservatives who are undecided. True, such a pick might alienate the more progressive democrats who have begrudgingly accepted Clinton as the democratic nominee. But, Clinton already has the progressive votes, what she need now is to install confidence in her ability to protect our country from its enemies. Still, liberals don't have to worry. A deeper look into Stavridis' background shows that to be false. His record is fairly progressive and left-leaning, and incredibly fair. An academic, he seems more pre-occupied with the law than political pandering--a statement similar to those said about Obama in 2008. On the Middle East, he favors international cooperation and interagency stabilization efforts; investment in Afghan security forces over US intervention; and maintenance of 15,000 troops rather than sending in additional "boots." To bring on someone who is liberal, yet strong on defense and security, is perhaps the smartest move Clinton can make. It asserts her commitment to national security, yet also proves she has listened to calls for a more progressive agenda. Jim Stavridis is a smart choice to guide us through an upcoming series of "Smart Wars." The two worked together often when she was Secretary of State--but as far as military-minds go, Stavridis is the best. Other pluses for Stavridis is that he is from Florida, a state the democrats must win, and that he would be a silver-tongued debater.